HomeCape Town Dentist BlogHow do dental implants work? Dental implants aren’t new – Prof Branemark placed the first dental implant in a volunteer way back in 1965 ! So much has changed since then in terms of bio mechanical engineering and our knowledge of physiology and healing. Dental implant treatment has become a common general dental procedure. Today it’s our go-to procedure to replace anything from single missing teeth to full mouth rehabilitation’s! Lets take a simple case for example. To replace a single missing tooth, we place the implant (made from the highest quality surgical titanium) into the jaw bone. We make use of a surgical guide to ensure the implant is placed in the exact optimal position. We have to plan this very carefully beforehand and we leave nothing to chance – that is why we make use of the latest 3D scan technology in our implant treatment planning. This usually doesn’t take long at all and it is a minimally invasive procedure performed under local anesthetic. 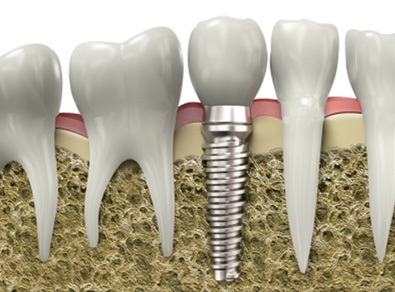 Our implant gets torqued to the required level and is now in the correct 3D position. The implant substitutes the root part of the original missing tooth. Once we have placed our implant, we very often (depending on the case) place a healing abutment on the implant during the same visit. The function of our healing abutment is to guide and shape the soft tissue (gum) for the final crown to come. The implant is then left as is for a period of 3 months. This is how long it takes to fully integrate into the jawbone. After the integration period of 3 months, we simply unscrew the healing abutment and take a impression to be sent to the lab for the manufacturing of the final crown. No injection is required for this at all! A few days later the final crown is torqued into the implant and the process is complete. It couldn’t be simpler! Implantology has revolutionized dentistry and today we are able to give patients their oral health and confidence back with predictable long term results.